It’s rare to see her in one place for a long period of time. You can find her running up and down the hallway, picking up phone call after phone call, or managing front desk at our 40th Street office. Adelina Molina, our Rock Star of the Month spends every second at MaxWell ensuring that each patient leaves the office feeling better. I visited Disneyworld and have confirmed that yes; it is the most magical place on earth. In my younger years I could have been the next Mary Lou Retton. Well, at least that’s what my mother thought. I’m quite the linguist. I can speak English, Spanish and Spanglish fluently. If I had a superpower it’d be the ability to shower, feed, dress, and drop off my daughter for daycare, study for school, get to work on time AND still find time to do my make-up. I love Twilight. In my past life I was definitely a werewolf. GO TEAM JACOB! I turned to facebook to discover what three things I would need on a dessert island but, I still have one question, will there be Wi-Fi? I can knit and crochet a mean scarf. Make your requests before I become the next Martha Stewart. As the mother of a toddler I am impressed by my daughter Nicole everyday, even if that means counting to 50 includes numbers like twenty-ten & thirty-ten. All this mega million talk has gotten me inspired. I’d buy my mother a well-deserved home of her own once I hit it big. Everyone says MaxWell Medical feels like a family and in my case, it is. Diana is my cousin. Whether it’s making time for patients at work, getting homework done for school or spending some quality time with her daughter Nicole, Adelina has learned the great art of juggling. Have questions for our champion of crochet? Be sure to post them and any knitting requests you may have on facebook or twitter. He provides knowledgeable advice, delivers a complete diagnosis, and sets up comprehensive, individualized treatment plans; all with a winning smile! It’s impossible to find him at the office when he isn’t delivering a joke or two. Dr. Arefin Siddique is an absolute delight and his professional and kind, bed-side manner is the reason he’s our Rock Star of the Month. We were able to catch up and chat with our pain-fighting Super doctor. 1. Forget Siskel & Ebert, more like Siddique & Ebert. I’m a huge Bollywood movie buff! 2. Dr. Siddique Medicine Man, I’ve traveled over 80 miles to see a patient in need of care. 3. I’ve crossed off “Scenic Drive from Vegas to LA” off my bucket list. 4. A companywide survey for best mustache reports that it’s a tie between Tom Selleck and me. 5. Before Hangover, I hit the strip in Vegas with a fearsome foursome…. My wife and two kids. 6. Sometimes laughter is the best medicine, in another life I would have been a comedian. 8. Outside the office, I go by dad, daddy, or Rinku Chacha. 9. After a one night stay at Hershey Park, my kids extended the trip because they discovered they didn’t have to make their own beds! 10. Even with all the traffic, an often 2 + hour commute, I STILL LOVE coming to MaxWell Medical everyday. 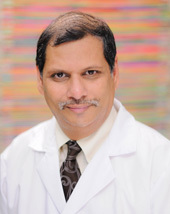 Dr. Siddique loves spending every minute of his free time with his family. With a household filled with woman he’s gained a certain knack for shopping. But, he is certainly dedicated to his patients, he will travel distances, stay late, just to provide the best care possible. He enjoys working with people and being able to help them Do More! Have questions for our medicine man? Set up an appointment with Dr. Siddique to find out how you can Do More! It isn’t unusual for this person to be too far from a step ladder or two. She stands at just less than 5 feet and is a bundle of joy at our office. But, don’t let her height fool you she’ll do some serious work on those aches and pains! 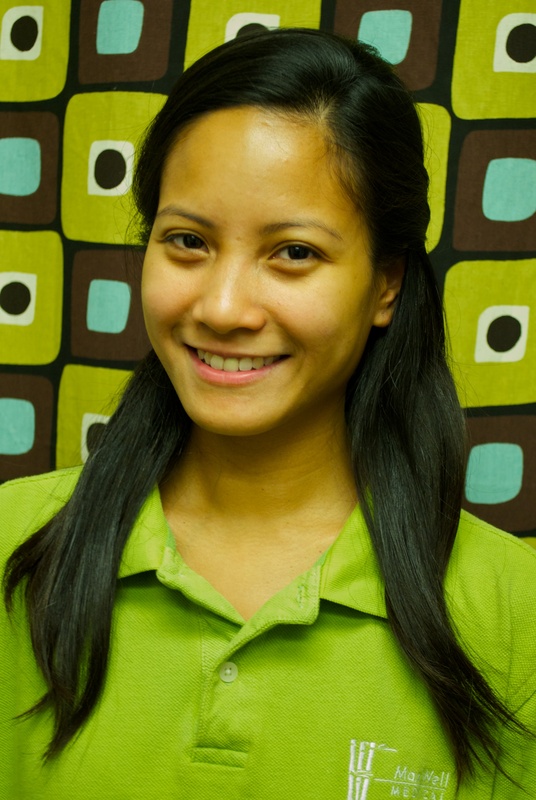 There is no doubt why this fearsome therapist, Ronnabelle Berdos is our recently engaged Rock Star of the Month! We were able to capture Belle for a few moments to learn more about her before she gets hitched! 1. I may not be the next Top Chef but, you should see me in the kitchen. 2. The critics give it two thumbs up; I make the best flan around! 3. I don’t have any tattoos but, I LOVE ROCK & ROLL! 4. I grew up in the Philippines surrounded by water but, I never learned to swim. 5. I’m the tiniest person at MaxWell Medical. 6. I’m vertically challenged and because of my small stature I have to wear a size 16 from the kids’ section! 7. Although I’ve never been a fan of sports other than Basketball or Boxing, my fiancé’s love for ESPN has me tuning in. 8. Others may be fans of Twilight but, I love curling up to a New Age Thought Book. 9. Whether it’s by force or to overcome my fear, I still need to muster up the courage to go on rides! Belle gains her strength from helping others and is certainly able to DO MORE! She may be scared of heights but, there isn’t a trigger pain that she can’t tackle! Have questions for our tiny therapist? Have any wedding day advice? Set up an appointment with Belle to find out how you can Do More! Alexander Gimpelevich. Try saying that 5 times fast. That’s probably why our Rock Star of the Month goes by Dr. G., instead. The always professional, sometimes humorous 40th Street resident doctor is a barrel of health and laughs. There’s so much behind those wire frame glasses we don’t know about Dr. G and are excited to find out! In between writing prescriptions, seeing patients and setting up treatment plans we sat one-on-one with Dr. G! I can “Bend it like Beckham”. Well, I try at least. I’m a romantic at heart but, sorry ladies I’m taken. I’m a book worm but, I only prefer reading historical books. “Yadda yadda yadda”. Not a fan of Friends, Seinfeld is my definite go to funny show. I want to travel back in time to experience the history I’ve spent most of my life reading. I want to travel to the future to see who wins the next World Cup. I was betting high while gambling in Vegas recently, I threw down $5! One of my most embarrassing moments happened during my medical school interview. When asked, “What is your most embarrassing moment?” I froze! GOAAAAAAAL!!! If I wasn’t a doctor, I’d be a professional soccer player! Paging Dr. G. MaxWell Medical gives me the chance to deliver the best patient care possible. Dr. G has three serious loves: His wife, his niece Ana and football! Football! Football! Dr. G has a Do More attitude on and off the soccer field! Have questions for our Ukranian born doctor? Set up an appointment with Dr. G. to find out how you can Do More! You wouldn’t know it by first glance but, our Rock Star of the Month was once a Rock Star himself! He’s been strumming away at our heart strings (and the guitar) since he was 15 and there are way too many classic Rock songs that would be a perfect ballad for Rob Steele, our Rock Star of the Month. He’s been a fan favorite for years but, he officially became a one woman man as of November 5th, 2011! Seconds after returning from his honeymoon we were able to have a powwow with Mr. Steele. 1. I was the very first Certified Orthopedic Massage Therapist in Manhattan! Take that knots! 2. You may say you love football but, I play EVERY Saturday in a flag league in Hoboken, NJ. 3. I can tell you a joke or three and that may be the reason I collect jokers from any card deck. 5. “I’m BIG in Japan!”…well…not really but, I can speak in Japanese! 6. For my honeymoon, I was serenaded by Mickey & Goofy at Disney World. 8. I have a great Halloween Costume track record. Ask my fans on Facebook! 9. I got fit for my wedding and am planning on staying that way! 10. I married the love of my life two weeks ago and we weren’t short of a few Celtic traditions! Rob’s a personal trainer, orthopedic massage therapist, a rocker, a Sports fan, and now a husband and father. There isn’t a role he’s not ready for. Rob is weekend warrior and has tons of Do More Attitude! Congrats again Rob Steele! Have questions for our newlywed? Set up an appointment with Rob to find out how you can DO MORE! She’s our pint size Office Manager with a deluxe size personality. She’s up for anything exciting and just came back from a trip to Vegas. 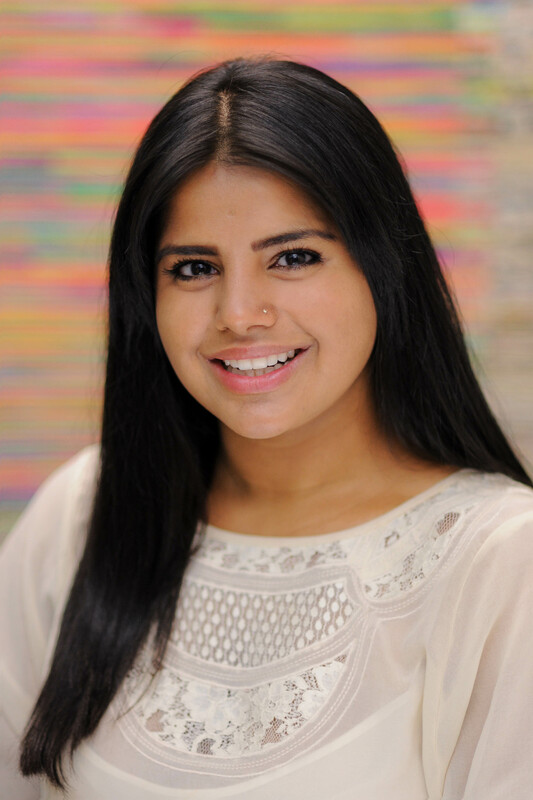 But, there’s more to Ferwah Rizvi, our Rock star of the Month than just her winning smile! Born in Karachi, Pakistan she is not one to sway away from an adventure. She has ridden on horses, camels and even elephants! Ferwah is a staff and patient favorite and there are endless reasons why. We were able to catch up to our adventure junkie to find out some interesting things about her! 1) For the past 6 summers, I’ve built houses in Tijuana, Mexico. 3) In my youth I enjoyed rides on camels on the beaches of Clifton, Pakistan. 4) I prefer chocolate chip cookies over the finest delicacies. 7) I’m a total adventure junkie, I’ve gone skydiving four times, cliff diving, kayaking, and white water rafting, and played intense games of paintball. 8) Although, I do not hesitate to go into the ocean, pool or river, I do not know how to swim. 9) I have difficulty telling left from right but, only when I’m navigating in a car. 10) I get motion sickness from crossing the street. Ferwah has been with MaxWell Medical from the very beginning and launched most of the initiatives that make our office great! 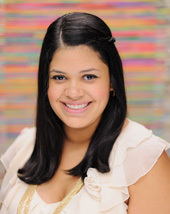 She is now the Office Manager of our newest location at 99 Wall Street. He’s a man of many words, few of which we can understand. He is also an invaluable, and often hilarious, member of the MaxWell Medical family. 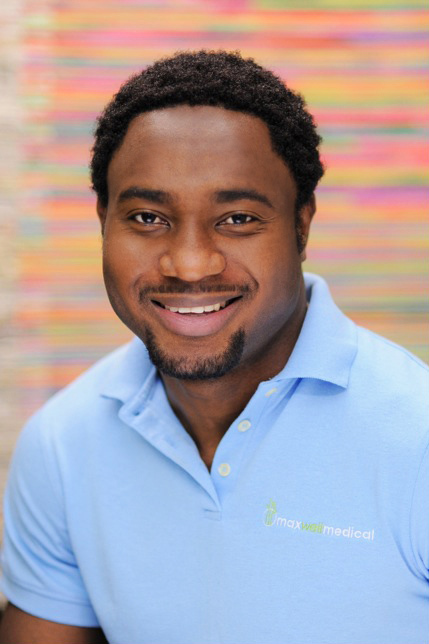 Our staff member of the month is our Doctor of Physical Therapy, Olayinka Akisanya. (But, we like to call him Yinka for short). Born inLagos,Nigeria, he moved to theUnited States3 years ago, is a graduate ofNew YorkUniversity, and has his doctorate in Physical Therapy. He is well known in our office for his unique way of speaking, his even more unique sense of humor, and his almost endless knowledge of the human body and how it works. Yinka took out some time from his globetrotting to sit down and tell us a few things about him. 1. I can’t bend it like Beckham but, I played soccer in High School and College. 2. I don’t need a gym membership. Manual therapy for my patients is enough of a workout for me. 3. I run 8 miles every day. 6. I studied for over 8 hours straight without any breaks. 7. My biggest weakness and my biggest strength is my determination. 8. I’m an International Man of Therapy.Lagos,Britain, theUnited States, and evenBulgariaare just a few countries I’ve practiced physical therapy in. 9. I believe in physical therapy after witnessing the remarkable recovery of a man who was paralyzed by Edwards Syndrome. 10. Contrary to popular belief, I am not a Nigerian Prince. Want to know more about Yinka? You can post your questions on our Facebook and Twitter pages.Yinka is available at either one of our Midtown locations. Call to set up an appointment to find out how he can help you Do More! She has a big Italian Sicilian family, was born and raised in Brooklyn and (minus a few years in Georgia) is a New Yorker, through and through. (Fahh get about it!) 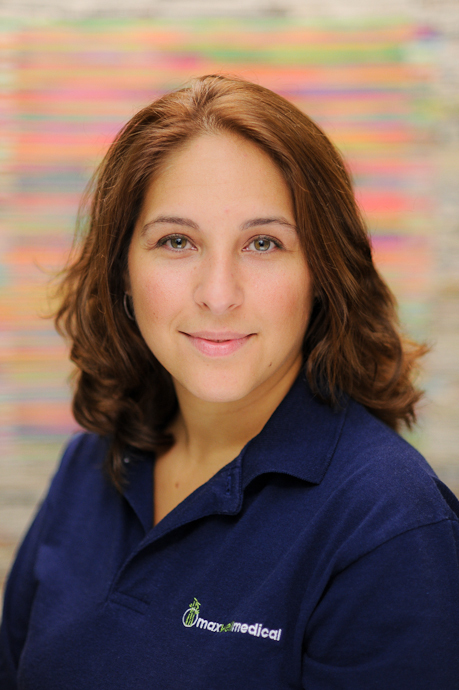 The newest addition to the MaxWell Medical family and our staff member of the month is our Wall Street resident Chiropractor, Dr. Lisette Rollins. As a busy Chiropractor, mother of a toddler and wife; Dr. Rollins was still able to share some interesting things about her most people don’t know. 1. My favorite person in the world is Evelyn, my 3-year-old daughter. 2. Secretly, I love to perform on stage, including acting and singing, but I haven’t been on stage since high school. 5. I own the laziest dog in the world and his name is Patches. 7. I do NOT care for water skiing and the feeling is mutual. 9. “To be or not to be”, Shakespeare’s Hamlet is my favorite play. 10. Before I became a chiropractor, I was a massage therapist for five years. Want to know more about Dr. Rollins? You can post your questions on our Facebook and Twitter pages. Dr. Rollins is available at our Wall Street office. Call to set up an appointment to find out how she can help you Do More! Loves to swim, play volleyball and was a track star for two years at Velez College. Yes, MaxWell Medical has another athletic staff member and her name is Melissa Soquite. Born and raised in the Philippines, Melissa has been an avid swimmer since the age of 6 and learned to play volleyball in grade school. But it wasn’t until sophomore year of college when she realized her “lightening” speed and her love of the track. In a matter of ten years, Melissa moved to the U.S., back to the Philippines and returned back to the U.S., received her degree in Physical Therapy, and is now engaged to her fiancé Russell. 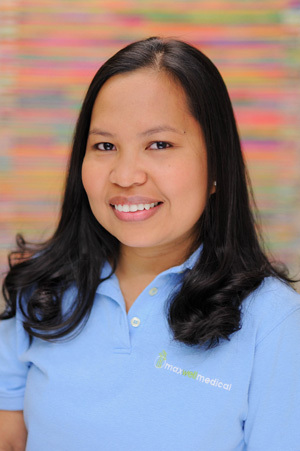 With a wedding set for next year in their homeland of the Philippines and working at MaxWell Medical, Melissa was able to take some time out of her busy day to answer a few questions for us. 1. Who is your favorite super hero? I would have to say the “Invisible Woman” in Fantastic Four. But I think more so of her abilities than the character herself. It would be nice to be able to go anywhere and do anything without restrictions. 2. Which song best fits your image and why? I would have to say any song that fits the mood at the moment. But for life in general, I like the lyrics for the song “Unwritten” by Natasha Bedingfield. It makes me think of living for the moment, learning from my mistakes and keeping an open mind! 3. What is the one thing that you have done in your life that you would want to undo? All the experiences I have encountered in life are equally important in helping me grow, so I don’t want to undo any of them. 4. Which is the trait you love the most and least about yourself? I think my being shy holds me back from a lot of things and I am constantly trying to work on getting over it (Like this very personal interview!). But I do appreciate my persistence and perseverance getting me through tough situations. 5. Why did you become a Physical Therapist? Growing up, I idolized my mother who was a strong hardworking nurse. I always knew I would be in the healthcare field as well. During my junior year of high school, I began receiving more information regarding the physical therapy program and once I started college, I followed my dreams. Would you like to find out more about Melissa Soquite? Post your questions on our Facebook and/or Twitter pages. Whether he’s hiking in Harriman State Park, Skiing in Vermont, running half marathons in New York and New Jersey, increasing his flexibility with yoga, coaching little league baseball, or salsa dancing the night away with his wife, Dr. Ron Nathanson always finds a way to stay active. Oh yea, and did we forget to mention that he has 3 kids? Wow! You’re probably wondering with family time, work and all these activities, how does he manage it all? Well he’s doing a pretty good job and he wouldn’t have it any other way. 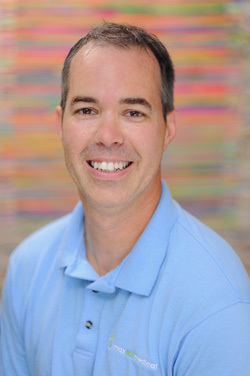 He enjoys his busy schedule especially the time he spends vacationing with his family, helping patients with their overall quality of life and connecting with his kids while coaching little league baseball. 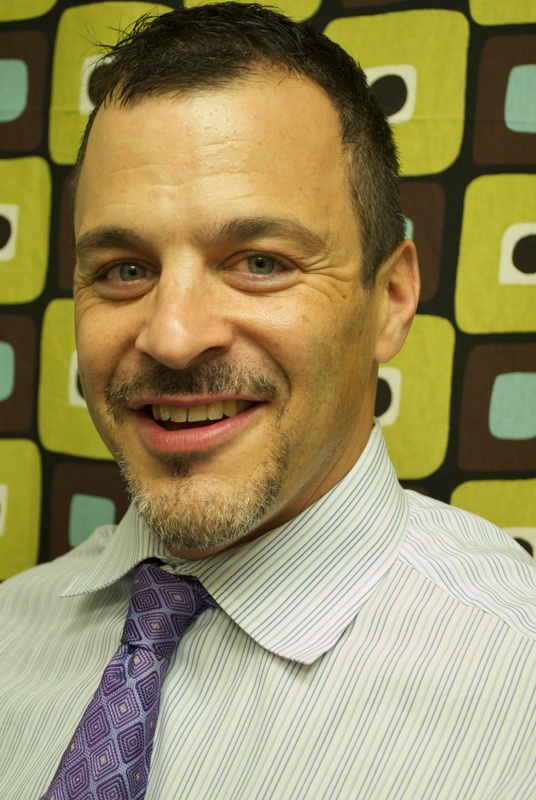 Even with his busy schedule, our staff member of the month, Dr. Ron Nathanson took some time out to answer some personal questions to help his patients get to know a little more about him. 1. What’s the most interesting food you’ve ever eaten? I’ve eaten Alligator, Ostrich and Buffalo. I am willing to eat anything just as long as it doesn’t bite back. 2. What are three things most people don’t know about you? The first thing people don’t know about me is that I was once the Mascot for the Northeastern University Huskies and I won All-American Mascot three years in a row. The second thing would be that I did mission work in Panama and adjusted thousands of people in just 10 days of being there. And the last would be that I love to hike and be outdoors. 3. Do you have any regrets? Yes, the one regret I have is not pursuing acting. I think I would have made a great actor. I would be a Humphrey Bogart, James Dean, Robert De Niro, Al Pacino, Robert Downey Jr., and Jack Nicholson all tied in one. 4. What made you want to become a chiropractor? I was working as a cab driver at Deluxe Taxi and taking classes at Nassau Community College when I was struck by a car while cycling. It caused numbness to my right hand arm and partial facial paralysis. It was a chiropractor who healed me. I was amazed and that’s when I found my calling. I didn’t choose it, it chose me! 5. You’re a father, husband, son, coach, what does each title mean to you? Father- Being loving, nurturing and having plenty of responsibility. Husband- Being a partner and being a loving companion to help each other grow. That’s the whole purpose of life. Son- Continue bringing them joy, being a great son, and helping them just as much as they helped me through life. Coach- It means to be a good teacher. I can help these kids find their inner strength and help them develop as people. Push them past their comfort zone. 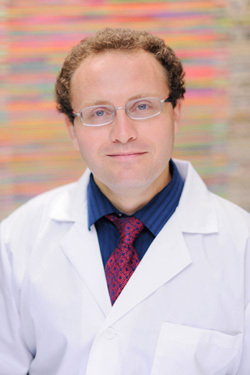 Want to know more about Dr. Ron Nathanson? You can post a question on our Facebook and Twitter pages. Dr. Ron is also available at our 40th Street office. Call to set up an appointment to find out how he can help you!